He had always wanted to be a warrior. The Rangers, with their dark cloaks and shadowy ways, made him nervous. The villagers believe the Rangers practice magic that makes them invisible to ordinary people. And now fifteen year-old Will, always small for his age, has been chosen as a Ranger's apprentice. What he doesn't realize yet is that the Rangers are the protectors of the kingdom. Highly trained in the skills of battle and surveillance, they fight the battles before the battles reach the people. And as Will is about to learn, there is a large battle brewing. The exiled Morgarath, Lord of the Mountains of Rain and Night, is gathering his forces for an attack on the kingdom. This time, he will not be denied . . . . If you are a fan of the Percy Jackson novels, or D.J. MacHale's Pendragon books, then you'd best turn your sight on the Ranger's Apprentice novels by John Flanagan. This book follows the story of Will, one of the wards at castle Redmont. All his life, he's been told that the Rangers--protectors of the kingdom--are people to be wary of. With their apparent ability to turn invisible and their mysterious ways. But when Choosing Day comes, and Will is turned down by every Master, only Halt will accept him--the Ranger that lives at the edge of town. Suddenly thrown into training, Will realizes what the Ranger's really are--the eyes and ears of the kingdom, to fight for their kingdom to have the upper hand at all times. They are the keepers of the peace. At Halt's instruction, Will learns the Ranger's ways from the bow and arrow to knife throwing. Will's been training for only a little while when word comes around that two deadly creatures are out and prowling the countryside and it's up to Will, Halt, and a few more good friends to find them and destroy them because the enemy of their kingdom is stirring--and he's ready to bring war upon them all. Absolutely one of my favorites. 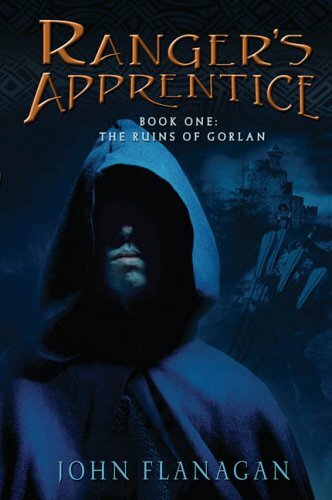 "Ruins of Gorlan" is the best out of the entire series. The light humor, fantastically fluid characters who seem to leap off the page and the bone-chilling monsters that John Flanagan brings to life, the Ranger's Apprentice series is perfect for a slow, rainy day when you need action with some characters you'd love to spend the day with.